Rigsy To Return In DOCTOR WHO Series 9 | Warped Factor - Words in the Key of Geek. Filming has begun on episode 10 of the new series of Doctor Who and Joivan Wade, who played Rigsy in last year’s Flatline, is back! "Getting to play in the Doctor Who toy box is a dream come true. It’s a total honour to contribute to a show that has brought me such joy as a fan. However, writing for Peter Capaldi and Jenna Coleman has presented a serious problem: some days I've been too excited to actually sit down and type!" 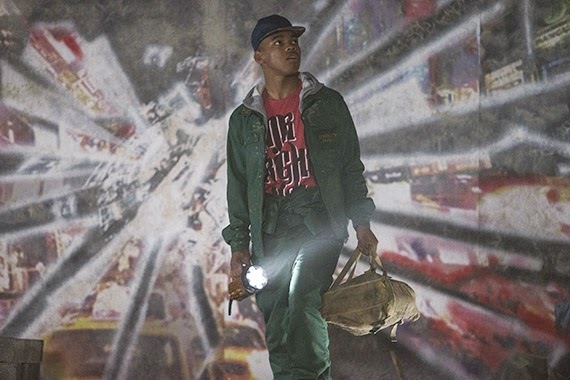 The episode sees the return of Joivan Wade as Rigsy, the young graffiti artist who helped save the world in Flatline. He’ll be reunited with the Doctor (Peter Capaldi) and Clara (Jenna Coleman) in this new adventure although how and why he finds himself mixed up with the time traveling heroes is currently under wraps! But we've pondered the possibility of a potential return for character already here. The guest cast for the new series includes Maisie Williams, Michelle Gomez, Rebecca Front, Rufus Hound, Paul Kaye and Jaye Griffiths. The BBC Cymru Wales produced drama will return to BBC One this Autumn with further casting to be announced. Here's everything we know so far about Doctor Who Series 9.